I asked around my blogger friends to recommend me a good dandruff shampoo. My scalp is dry and sensitive, with stress and being sick the past month my dandruff has become insane leading to hair fall (bcoz I like scratching, picking & pulling my hairs). Nothing serious really, all I need is to cleanse, balance and treat my scalp problems. I didn't become a beauty blogger for no reason =_= all the product reviews, workshops and event I attend did educate me haha. Surprisingly Selsun yellow was on the top mentions when I posted my question on a beauty blogger group. I never heard of Selsun yellow until now. Apparently yellow is the scalp treatment, only to be used once a week. The Selsun blue is the shampoo which you can use daily. The thing about Selsun products is it's drying. Well actually most dandruff or medicated shampoos are drying. No helping it. update: just used Selsun yellow. It's watery liquid, shocked when I first pour it out. 2nd shock was that the liquid when I apply and massage on my hair was really foamy. It doesn't have a strong medicated scent like Selsun blue. I bought Selsun yellow from Watson's Paradigm Mall (1st floor, middle) RM46.60 for 200ml wow expensive. Then I bought Tsubaki Head Spa 550ml RM23.80 (recommended by my friends as well) because I needed a simple, gentle clarifying shampoo with clear liquid to balance and cleanse my scalp from all the product build ups (serums, oils, bla bla). Those with cream liquid are too moisturising for my scalp which does not help with my scalp problem. I'm avoiding these shampoos now and salon professionals has been repeatedly advising me to stay away from Pantene, Dove, etc citing they're not good for the scalp. update: just used this and I am in love with this shampoo! Smells so relaxing and spa-ish. While I was walking around, I saw a Shins poster for NIOXIN at a great deal. I used Nioxin once, loved it because it was a scalp friendly shampoo that's refreshing and cooling. Helped with my sensitive scalp problem and hair thinning issues but it was really expensive so I never repurchase. However today I saw the 1L shampoo & conditioner at a great deal of only RM87 (shampoo) and RM82.90 (conditioner). Normal price is RM200++ for 1L. 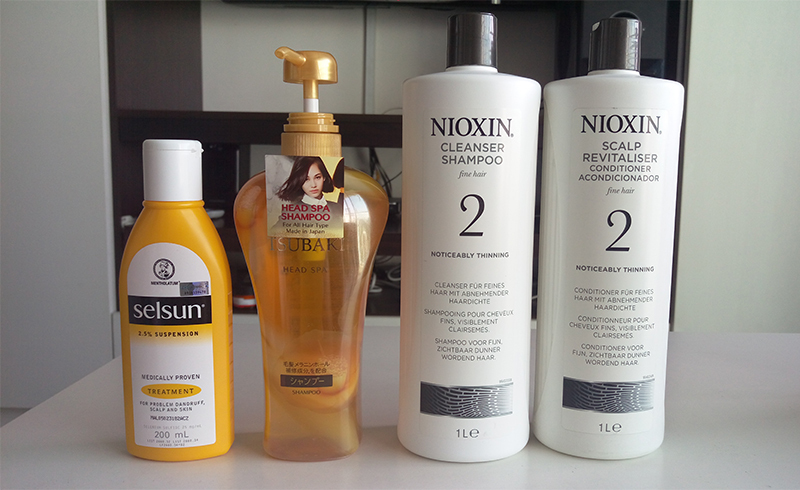 Nioxin is the #1 selling salon brand for thicker, fuller hair. It's for thinning hair problems. I don't want to go to deep into explaining what causes hair thinning problems but in short, dandruff is one of the causes for hair thinning (hair fall). Your scalp is producing sebum & cell turnover rate is going at the speed of light. Your hair follicles are clogged, scalp gets irritated (itchy, inflame, red) you start picking, scratching, etc. They can't breath, hair gets weak, it falls or gets pull when you scratch your scalp. update: just used the scalp revitalising conditioner, sooooo cooling !!! love love love. My hair is bleached & coloured so dry is an issue after I use treatment shampoos. The conditioner made it soft and bearable. I'm going to use this conditioner for the duration of my anti-dandruff plan. Nioxin comes in as a scalp cleanser to help remove follicle-clogging sebum, fatty acids and enviromental residues from the scalp and hair. The Nioxin 3-Step System starts with cleanse (shampoo), optimise (scalp revitaliser conditioner which you can use on hair and scalp) and treat (scalp treatment). It's been proven to work with many testimonials from it's users. You can read more about Nioxin here. It's really popular with proven results and testimonials from its users. I'm pretty much happy with my hair haul from yesterday. I hope I'll be able to calm down my scalp, nurse it to health and control my dandruff outbreak. The amount of hair on my floor is crazy. Oh you might be thinking why I needed to buy two types of shampoo. Well I like to alternate my shampoos depending on my scalp sebum mood. If it's a particularly normal day, I'd used the Tsubaki Head Spa and if I have been using a lot of oils and my sebum has built up due to sweat, hot weather, etc, I'll go for Nioxin. OH and very important is with dandruff issues, must not air dry / natural dry your hair! Use a hair-dryer / blower to avoid your scalp being all wet and nice for your dandruff friends to become happy and active. I learnt this from hair salon experts haha. If you want to grab that Shins deal, I'm not sure if it's the same deal all at Shins store but the Shins I went to is on Concourse Floor, Paradigm Mall near Etude House (which is having Buy 1 Free 1 Sales now).